The gluteus maximus and gluteus medius are two large muscles in the buttocks that contribute greatly to forward and upward propulsion, and also to lateral or sideways motion. The gluteus maximus, along with the hamstrings, are recruited in any forward bending movements involving hip extension, resulting in the thigh or top of the pelvis moving backward, such as in step-ups and stiff-legged deadlifts (see www.bodyresults.com/e2hamstrings.asp for descriptions), good mornings, squats, lunges (see www.bodyresults.com/e2freelegs.asp for variations), or traditional deadlifts. Who Needs a Strong Gluteus Medius? If you tend to experience sore or tight hips in early season as you are getting accustomed to the additional weight of carrying your backpack, then you may want to incorporate several of the following targeted exercises for a few weeks leading up to your first backpacking, hiking, or climbing trip to focus on the gluteus medius and balance out the larger hip and thigh muscles. If you want “rump results” without doing traditional strength training, simply add a backpack to your elliptical, stair, hill climbing, or treadmill workouts and you will add nice shape and definition to the buttocks. The following exercises are just as advantageous for those who venture to the gym to sculpt the posterior as they are for those who need power and stamina going uphill. The exercises are arranged in order from easiest (or most targeted) to most challenging (i.e. requiring the most balance, practice, or technical skill to perform properly) and should be added to your program in similar fashion. Hip Hike – Stand sideways on a step, box or bench at least 4” high, with one leg held free of the bench. It helps to do this exercise facing a mirror, with belt-line or waist-line visible. Keep both hips squared forward and shoulders level. Keeping your standing leg (the one on the bench) straight (no knee bending! ), raise your free hip directly upward and then drop the leg down so that your beltline alternately tilts up and down. To increase the difficulty of this exercise, add ankle weights to each leg or hold dumbbells in each hand. This exercise is one that many physical therapists use to help correct what is known as “Trendelenburg gait” in which the affected hip goes into hip joint adduction during each weight-bearing phase (step) of a walking gait. The femur (thigh bone) tends to ride upward, causing a pronounced limp or waddle. Forward Straight Leg Raise – Lie on one side with bottom leg bent (the one closest to the floor) and top leg extended in front of the body at a right angle to the torso. Keep a slight bend in the top knee, with hips stacked, and avoid shifting the body backward as you lift the leg up. Keep the heel higher than the toe in order to maximally recruit the glutes. Add a ski boot or ankle weights when the weight of the leg becomes too easy. Perform the same number of sets and repetitions on both legs. For greater comfort extend the arm along the floor and rest your head on it for support. 1-leg 1-arm Deadlift – One of our favorite exercises for hip and glute strength, as well as stability and balance in the ankles, calves and feet, is this version of an exercise featured at www.bodyresults.com/e2hike30day-p1.asp that more directly targets the glute medius. Stand on your right foot with a dumbbell in your right hand for 3-8 repetitions, then without changing legs, complete the same number of reps with the left hand before switching to the other leg and repeating half the reps with weight in one hand, half with weight in the other. Bend your standing leg into a squat as much or as little as you feel comfortable doing until you can touch the floor with the dumbbell. For a challenge, stand on a slightly elevated surface such as 1) a 25# plate, 2) two-by-fours, 3) plyo boxes, or 4) (most advanced) a half-foam roller which will really challenge the lateral stability in the abductors and glutes. Bridges – Lie on your back with R ankle resting on L knee, L foot flat on floor about two feet from your buttocks, and arms on the outside of either hip for balance. Exhale and press down on the L foot to raise hips off the floor. To ensure that hips stay parallel (i.e. one does not drop to the floor as you lift) place your hands on each hip socket and concentrate on keeping the pelvis level. Repeat same number of sets and repetitions to the other side. A variation is to extend the non-working leg into the air (as pictured, black and white) for a mild hamstring stretch at the same time. 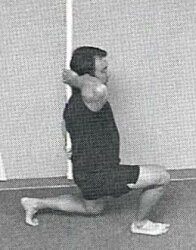 Additional similar exercises targeting the hamstrings are pictured and discussed at www.bodyresults.com/e2hamstrings.asp. You can also position a bench a few feet from your buttocks and rest both heels on the bench, then unweight one leg and lift hips upward with the other. For maximum bodyweight challenge, try placing both feet on a ball and allow the ball to roll in closer to the body as you bridge the hips upward until your torso forms a straight line from shoulders to knees.